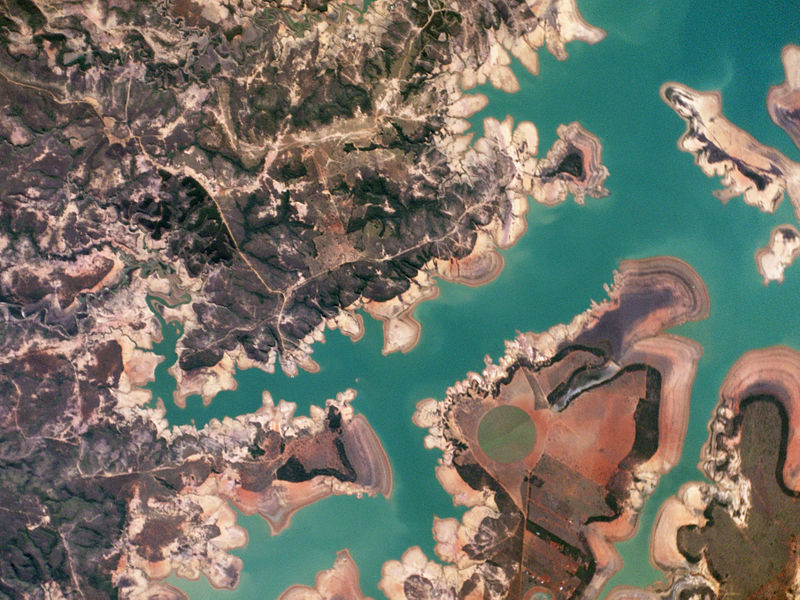 Três Marias Reservoir, Minas Gerais Brazil – Planet Labs Satellite image. The Represa Três Marias, the result of damming the São Francisco river, is one of the largest reservoirs in Brazil. In 2014, Minas Gerais experienced one of the worst droughts of the last 50 years. A convergence zone is defined as a location where two or more forces meet – characteristically marked by some form of turmoil. São Paulo, Brazil, home to over 20.1 million people, capital of the world’s 6th largest economy, and one of the most populous cities in the Americas, finds itself in the middle of a convergence zone increasingly being intensified by environmental variability. Brazil’s epic drought (now in its third year) is lamentably one of the most under-reported and least appreciated human security stories this year, but there are crucial insights to be learned from Brazil’s experience. These insights point to a need for policy making that is informed by a more nuanced understanding of the multi-dimensional impacts of climate change on human security and political stability, especially in cities across the Americas. Last September, we first shared our thoughts on how the extreme drought was affecting Brazil’s economic and political stability, and by extension its national security. In that piece, we noted that “this protracted instance of water stress seems to have deepened distrust in the government’s ability to provide essential security.” We also shared the projection that “it is hard to see Brazilians not blaming government corruption and ineptitude as causal factors for the crisis,” while noting that to date, there had been “no large water protests.” Revisiting the unfolding saga nine months later we find that frustration with the government on this issue has deepened considerably, and is converging with other events and trends to potentially threaten political stability. Yelling slogans like “I pay … but I shouldn’t… Because water is not a commodity,” protestors stressed by the water crisis in São Paulo last February brought out over fifteen thousand men, women and children. This was the first major public protest on the water crisis and was intended to hold the government of São Paulo and Sabesp (the publicly traded water and waste management company owned by São Paulo state) responsible for the crisis. Further, as anxiety spread about water rationing, some São Paulo residents began stockpiling water in open containers, leading to a surge in dengue fever earlier this year. The outbreak has now been contained, but other woes persist. A 2014 study conducted by non-profit sanitation organization Instituto Trata Brasil found that more than one third of the city of Sao Paulo’s water was lost between the treatment plant and consumers’ faucets. But citizens didn’t need a study to confirm what they long suspected. The popular sentiment is that city planners, as well as Sabesp, knew that an extended dry period was coming and did nothing to prepare. The specific accusation is that water main leaks and contamination were well known, and that officials did not make timely investments to mitigate the impacts that now affect over one hundred cities. An April, 2015 Fortune Magazine article that explained why one of the world’s top fresh water bastions is suffering water stress shared that “If any nation had cause to be complacent” about its water supply, it was Brazil. A country known for its lush and vast rain forest and the most voluminous river in the world – the Amazon – once feared being persistently flooded by its overflowing rivers and storms than any other man-made or naturally occurring threat. Mr. Antonio Nobre, a leading climate scientist at INPE, Brazil’s National Space Research Institute explained that global warming and deforestation in the Amazon continues to drastically reduce the release of billions of liters of water by rainforest trees, which reduces rainfall further south. In a phone interview conducted on 25 May, 2015, Dr. Augusto Jose Pereira Filho, a professor of atmospheric science at São Paulo University explained that lower than normal temperatures in the lower Southern hemisphere has had the effect of drastically reducing evaporation from the southern Atlantic (the largest source of atmospheric moisture for the region) leading to dry lower atmosphere across Southern Brazil. However, the vexing drought threatens more than water security in Brazil. It also threatens to impact another critical public good – electricity. Brazil has been lauded internationally for its efforts to leverage its ample natural water flows to produce hydro-electric energy. The costly effort has been transformational and today about two-thirds of Brazil’s power grid is dependent on hydroelectricity. A predominately hydro-electric grid is supposed to insulate this rapidly growing economy from high global energy prices while creating one of the greenest economies in the world. But it now appears that the “hydro” transformation has eliminated one set of vulnerabilities only to introduce a new set. In a press conference with reporters in Brasilia last January, Energy Minister Eduardo Braga explained that ten-percent is the absolute minimum dam level – a red line – required to operate hydro-electric power plants. Reservoirs in Brazil’s southeast and central regions were at thirty percent of their capacity at the end of April – normal is over sixty percent. According to forecasts by the non-profit private entity responsible for the coordination and control of electricity generation and transmission (Operator of the National Electricity System), at this low level, and at current consumption rates, the dams are expected to hit the ten percent “red line” in November, 2015. However, officials have decided to hold off on electricity rationing as they are betting on a wetter than normal dry period due to an expected atmospheric warming anomaly. Should water supply woes continue (concurrent with electricity rationing) the deepening disillusionment with President Dilma Rouseff could reach a tipping point. An embattled Rouseff with approval ratings in the doldrums is fighting off calls for her impeachment due to a potentially mortal political wound involving Petrobras, the country’s semi-public multinational energy corporation. It is likely that the Rouseff presidency will be tested to the breaking point during the long “dry period,” especially if persistent water shortages are compounded by electricity rationing. As we noted previously: “When a country the size of Brazil, the most populous and economically consequential nation in South America, faces protracted water stress, with implications for both water and food security, it will have ripple effects across the globe.” This remains true today, especially with regards to international food markets. Brazil is the world’s leading exporter of soybeans, coffee, orange juice, sugar and beef, and production forecasts are down by double digits for most of these commodities, creating a new set of winners and losers. Perhaps the most salient lesson to be learned from Brazil’s drought experience is the imperative for policy makers to factor environmental variability into their governance calculus, or face the risk of tremendous loss of faith at best, or popular unrest at worst. The normal weather patterns that urban zones have organized around (and taken for granted) can no longer be deemed a near constant. Finally, the convergence of poor decisions making, complacency, rapid growth and environmental variability is increasingly defining Brazil’s future. We hope that leaders across the hemisphere, and the globe, are taking notice. By Caitlin Werrell and Francesco Femia in climate and security on June 3, 2015 . It’s raining like crazy now. The Paraná is above flood stage, flooding extends all the way down to Argentina. The Lula/Rouseff policies emphasized footbal and Olympic sports construction, and too much state over investment in deep water oil. This is the root cause of Dilma’s problem.